Last Saturday was Taylor’s graduation. We spent the night before in a shared hotel room with my parents and Taylor's mom and sister down the hall. The next morning we got up early and made our way to the college. The speakers didn’t take long and the ceremony really wasn’t that long, but it took a while for all of the doctoral candidates to be hooded. It was all worth the wait, though, when we saw Taylor! It was a very exciting time for all of us. I think that even our kids understand the huge accomplishment that this is. It was a wonderful day full of celebration and although he walked then, he didn't technically graduate then. 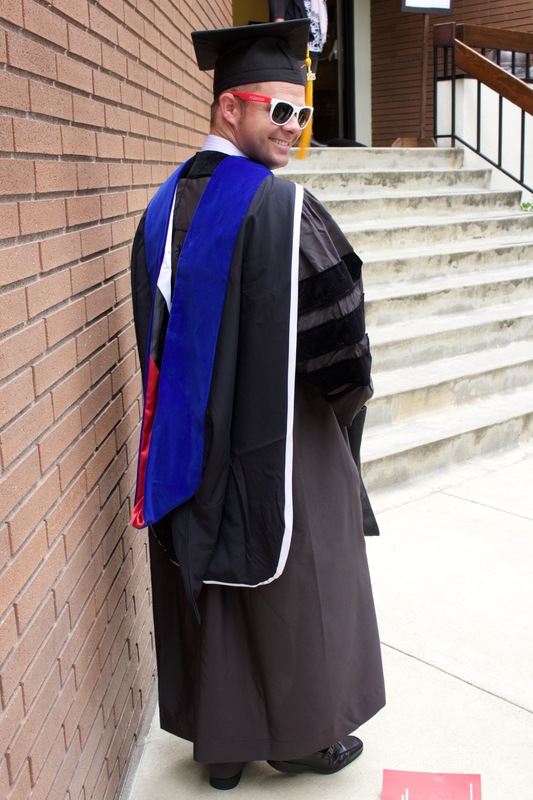 Today was that final step in Taylor's doctoral status. The one thing that needed to be finished that he was unable to schedule before graduation was the defense of his dissertation. That happened today. We got a babysitter to get the kids off to school this morning and the two of us drove to Claremont to close the books of this long journey. The defense went really well. I sat there thinking that it’s a good thing he was the one doing the talking, not me, because I’m sure I would be stumbling over my words and thoughts. Taylor was very succinct and always knew exactly what to say and how to answer every question. After about an hour of talking and questions, we (Taylor, his dad, and I) were invited to leave while the committee deliberated. It didn’t take long before we (although just Taylor went back in because I was in the bathroom) were invited back in and Taylor was told that he passed. He wasn’t asked to make any revisions or anything. He just passed. And just like that, he’s done! A momentous occasion indeed. I was thinking while at graduation last week, all of the time that this has taken him. Taylor started graduate school when I was barely pregnant with London, more than ten years ago. He finished his doctoral course work and took his qualifying exams when I was just a month or so away from delivering Ashton. That was more than six years ago. Our kids have no idea what it’s like to have a dad who isn’t in graduate school. They are as excited as we are that he’s finished and this summer we can really celebrate because Taylor will get to be with us, without a dissertation hanging over his head.